Yesterday’s stage proved to be a far tougher affair than expected, as after the day’s breakaway was reeled in surprisingly early on by Team Sky, Chris Froome then took inspiration from Vincenzo Nibali to attack on the final descent and earn himself both stage honours and the maillot jaune. Today is bound to be another gruelling day in the mountains, especially for those who only just ducked within yesterday’s time cut by the finish. Favourites for the general classification will wish to test one another here, so fireworks are on the cards, but whether they shall decide the day’s outcome is another question. 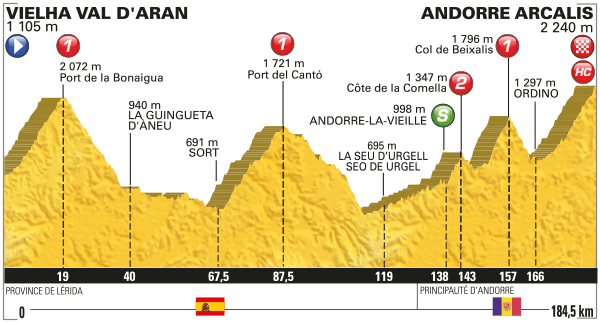 It is a 184.5km journey from Vielha Val d’Aran to Andorre Arcalis, taking in both Spain and Andorra, demanding the riders to haul themselves over three Category 1 ascents and the final HC summit finish. Dan Martin has recently moved to Andorra, where the latter part of today’s stage finishes, so should feel confident of utilising his knowledge of the area to great effect. The Irishman is certainly unable to compete at the same level as Chris Froome or Nairo Quintana across a three week grand tour, but when he focuses upon a targeted stage, Martin is a difficult man to tame on his desired terrain. Chris Froome often takes the earliest opportunity afforded to him in order to grab the race by the throat and establish an early chokehold upon his rivals. Yesterday’s success will have only encouraged him further to ride aggressively here and Stage 9 has long stood out as the ideal day for Froome to attack his rivals. Judging by what we saw on Stage 8, there is every chance that the Sky leader shall make it back to back wins in the Pyrenees. Nairo Quintana has been billed as Froome biggest rival at this year’s Tour de France, even more so now that both Alberto Contador and Vincenzo Nibali look to have gone off the boil rapidly. The Colombian mountain man has already lost time to Froome and will have to attempt to make it back on these inclines, as there is little chance of him doing so once it comes to the individual time trial. Movistar have not looked perfect in their work to support Quintana thus far, though Stage 9 will have been circled as a crucial day in this three week battle, so it is safe to assume they are well prepared for the fight. Richie Porte often slips under the radar somewhat, but those in the know shall be aware that he deserves being in the frame on these tough mountain stages. He did lose time early on in this race, so is certain to be poised to capitalise upon any chance he spots to regain his losses at the earliest opportunity possible. As a member of a reduced lead group, his placing on the general classification right now could provide enough freedom to take the win, while the likes of Froome and Quitana busily eyeball one another behind. Thibaut Pinot has already tried his hand at taking back time after a disastrous performance on Stage 7, but yesterday Team Sky were not interested in allowing him to stay up the road as part of the breakaway. The Frenchman has spoken publicly about his frustration at once again coming unstuck so early on at his home race, fully aware of how encouraging his performances have been earlier this season. If he decides to focus his attention on winning the polka dot jersey instead now, then today is the perfect opportunity to collect points. Rafal Majka will have to follow Pinot if the Frenchman does attack, as the Polish rider is also interested in securing the mountains classification. Having previously won the competition, he has great experience of knowing how to ride this extremely tactical battle in order to emerge victorious by the time they reach Paris. A breakaway remains a strong possibility here, so riders worth keeping an eye upon are: Jarlinson Pantano, Tanel Kangert, Daniel Teklehaimanot, Ilnur Zakarin, Jurgen Van Den Broeck and Nicolas Edet. Posted on July 9, 2016 by Spokenforks	This entry was posted in Le Tour de France, Le Tour de France 2016, News and tagged 2016, Andorre Arcalis, Chris Froome, Dan Martin, Daniel Teklehaimanot, Ilnur Zakarin, Jarlinson Pantano, Jurgen Van Den Broeck, Le Tour de France, Le Tour de France Stage 9 Preview, Nairo Quintana, Nicolas Edet, Rafal Majka, Richie Porte, Tanel Kangert, Thibaut Pinot, Vielha Val d'Aran. Bookmark the permalink.